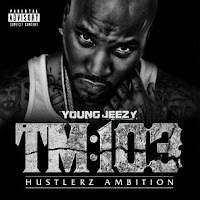 The December 20 release of 'TM:103 Hustlerz Ambition' is fast approaching and not only has Jeezy disclosed the cover art to his imminent release (see image) but he's released two short clips (there'll be another 3 in the next few days) from the docu-film, narrated by Samuel L. Jackson, that will accompany the album. Check the trailers below and lets hope that the album maintains the same standard of production of 'F.A.M.E.'! Nice to see a track produced by Warren G on the album!